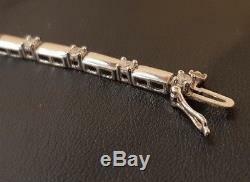 (pa2) 9ct White Gold Diamond Link Bracelet - 1.00CT Total. 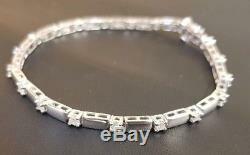 1.00CT Diamond link Bracelet. This lovely diamond link bracelet is made from alternating solid gold links and 4-claw set 5pt diamonds. The bracelet is fastened with a typical spring-loaded bracelet clasp and secondary clip. Unfortunately we are not diamond graders and cannot offer Colour or clarity on the stones. The weight for the 19 stones is approx. 5pts each, and a total of 1CT (as stamped on the inside). The stones are white in colour but do have multiple visible inclusions with the naked eye, with the majority being bright and sparkly. This statement bracelet has been crafted from 9ct white gold, which is fully hallmarked. Hallmarks include 375 for gold purity and the London assay office mark. It is in used but good condition so has some slight signs of general wear. We acid/assay test all of our items to guarantee the carat of gold. Please note we only sell within the UK. WE CAN SIZE ALL RINGS UP OR DOWN. We were established in 1994 and have been serving the public ever since. We pride ourselves in offering a reliable and honest service and hope to be able to provide you with well priced, good quality goods and services. We offer an extremely competitive retail service. If you need well priced jewellery, secondhand bargains, handmade bespoke gem set jewellery, repairs, electrical goods? We have a vast range of DVD? S, Games, Music and much much more which may not be listed on our web site. Please see list below to see the popular items we sell. Personal Audio and MP3 Players. Lots of our customers use this service to spread the cost of Christmas and Birthdays. These payments, as well as cash, can be accepted in our Parkstone, Poole retail Store. These charges are based on Royal mails standard rates. Size and weight of the item will reflect a different range of prices. We sell a mixture of New and pre-owned Goods. Unused and/or As New items. These are not new, however; they remain in their original boxes in new condition with receipts and warranties intact. Further details of which can be found on the individual listing. These are previously used, worn second hand jewellery with varying accessories and conditions. You are also more than welcome to collect the item in person at our store. If your item develops a fault. Faults with the electronic that we sell are unlikely due to testing although, problems can sometimes occur. In regards to an item that has suffered a manufacturing defect, these may be covered under, one of two warranties depending on the item. Some issues can be rectified by guidance from our assistants. If this is not the case, we will also suggest the best course of action. Negotiating on items can only be done via the'Best Offer' button on the listing. To stay compliant we will not respond to any private messages with offers. If the customer has any problems they can send it back and we will fix it or replace it or offer online store credit. For further details please read the terms and conditions. This listing is currently undergoing maintenance, we apologise for any inconvenience caused. The item "(pa2) 9ct White Gold Diamond Link Bracelet 1.00CT Total" is in sale since Wednesday, April 4, 2018. This item is in the category "Jewellery & Watches\Fine Jewellery\Fine Bracelets\Diamond". The seller is "lainhead_electricals" and is located in Poole. This item can be shipped to United Kingdom.